Boosts the Pokémon’s Speed in rain. X The line running down its side can store sunlight. It shines vividly at night. X Die Linie an seiner Seite kann Sonnenlicht speichern. Nachts leuchtet es sehr intensiv. X La ligne qui fait le tour de son corps stocke l’énergie solaire et brille dans la nuit. X La línea que le recorre el costado puede almacenar luz solar. Brilla con mucha fuerza por la noche. X La linea che contorna il suo corpo immagazzina la luce solare. Di notte si illumina di una luce splendente. X 몸의 옆쪽에 있는 줄에 태양의 빛을 모아둘 수 있다. 밤이 되면 아름답게 빛난다. Y After long exposure to sunlight, the patterns on its tail fins shine vividly when darkness arrives. Y Wurden die Flossen lange dem Sonnenlicht ausgesetzt, leuchten sie in der Dunkelheit. Y Après une longue exposition au soleil, les motifs de ses nageoires caudales luisent à la nuit tombée. Y Si se expone mucho al sol, los dibujos de sus aletas brillan en la oscuridad. Y Dopo una lunga esposizione al sole, i motivi sulle sue pinne brillano vividamente al calar dell’oscurità. Y 햇볕을 잔뜩 쬔 꼬리지느러미의 무늬는 어두워지면 선명한 색으로 반짝이기 시작한다. Omega Ruby After long exposure to sunlight, the patterns on its tail fins shine vividly when darkness arrives. Omega Ruby Wurden die Flossen lange dem Sonnenlicht ausgesetzt, leuchten sie in der Dunkelheit. Omega Ruby Après une longue exposition au soleil, les motifs de ses nageoires caudales luisent à la nuit tombée. Omega Ruby Si se expone mucho al sol, los dibujos de sus aletas brillan en la oscuridad. Omega Ruby Dopo una lunga esposizione al sole, i motivi sulle sue pinne brillano vividamente al calar dell’oscurità. Omega Ruby 햇볕을 잔뜩 쬔 꼬리지느러미의 무늬는 어두워지면 선명한 색으로 반짝이기 시작한다. Alpha Sapphire The line running down its side can store sunlight. It shines vividly at night. Alpha Sapphire Die Linie an seiner Seite kann Sonnenlicht speichern. Nachts leuchtet es sehr intensiv. Alpha Sapphire La ligne qui fait le tour de son corps stocke l’énergie solaire et brille dans la nuit. Alpha Sapphire La línea que le recorre el costado puede almacenar luz solar. Brilla con mucha fuerza por la noche. Alpha Sapphire La linea che contorna il suo corpo immagazzina la luce solare. Di notte si illumina di una luce splendente. Alpha Sapphire 몸의 옆쪽에 있는 줄에 태양의 빛을 모아둘 수 있다. 밤이 되면 아름답게 빛난다. Sun It absorbs sunlight with the pink areas of its skin, which then shine. This appears to be a form of camouflage. Moon Its double tail fins propel its energetic jumps. When it breaks the surface of the sea, Wingull swoop down to grab it on the fly. Diamond When it is showered with lots of sunlight, the pattern on the fins of its tail deepens and shines with a sharper color. Pearl The way it swims by flapping its two fins earned it the alternate name Beautifly of the Sea. Platinum The line running down its side can store sunlight. It shines vividly at night. 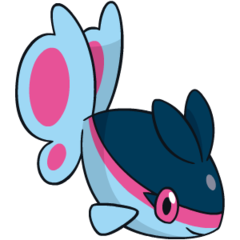 HeartGold Swimming and fluttering its two tail fins, it looks like a BEAUTIFLY. At night, the patterns on its tail fins softly shine. 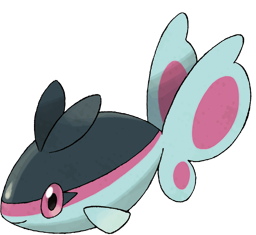 SoulSilver Swimming and fluttering its two tail fins, it looks like a BEAUTIFLY. At night, the patterns on its tail fins softly shine. Black The line running down its side can store sunlight. It shines vividly at night. White The line running down its side can store sunlight. It shines vividly at night. Black 2 The line running down its side can store sunlight. It shines vividly at night. White 2 The line running down its side can store sunlight. It shines vividly at night.